Man writing curriculum vitae at his desk. Photo courtesy of Shutterstock. Finding jobs these days isn’t as hard as it was in the past. Today, we’ve been bestowed with the greatest technology of all–the Internet. Still, with all the advancements and convenience readily available to us, we sometimes find it hard to secure job interviews. We ask ourselves why we can’t get an interview call from anywhere, even with all the right skills and talent. Well, clearly it is not skills or talent creating a huge gap between you and an interview, but it is your resume. Sadly, some people close their eyes to the dull rendition of their resumes, and they keep sending them to prospective recruiters until they find themselves completely worn out and hopeless. Recruiters don’t have all day to sniff out potential candidates from the hundreds of resumes sent their way. They simply skim through the clutter and shortlist only those resumes that “WOW” them. So, if you want your resume to get the attention it deserves, you need to make it visually appealing. Let me present you with a hand-picked collection of online resume building tools to turn your dull resume into a supremely refined one. If you’re new to the employment sector and don’t know how to create a resume, Represent is your best option. It lets you create a minimalist resume that mainly focuses on the neatness of the areas that truly need to be highlighted such as work experience, education, skills, etc. Though the tool doesn’t offer much creative elements to play around with, you’d still walk away with a neat and well-presented resume. It also offers built-in analytics to keep track of your resume’s performance. Moreover, you can also send the resume directly to your Dropbox and easily access it from anywhere. Turn your resume into an infographic, a splendid visualization of how far you’ve come in your career. With Visualize at your disposal, you don’t need to sculpt a resume from scratch. Just link your LinkedIn account with Visualize, and voila…your resume turns into visually stunning data. Visualize lets you play with six different themes, and it includes dozens of fonts and colors. You may end up with something that captures the recruiter’s attention at first glance. You may add more data to the template through the “Profile” tab, or change the color scheme, fonts, and background on the “Styles” tab. Download the resume by pointing to its sister site, Venngage and you’ll be prompted to sign-up. Resume Shoppe is the ideal choice for people who don’t want to settle on anything ordinary – something that can be found anywhere. The website offers a plethora of resume templates that are not just well-designed but also highly flexible with any industry for instance creative artists, engineers, digital marketers–you name it. You can even download the CV templates for Word to customize the document or simply fill in the boxes with relevant data such as work history, qualification, etc. 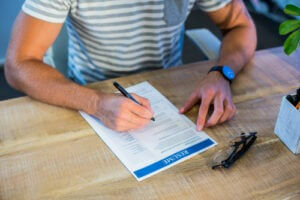 Best of all, get the matching cover letter template for an added fee. LinkedIn is the online platform for professionals around the globe. It is the digital version of your resume that gives significant exposure to industry leaders, prospective employers, or recruiters. Remember that recruiters see a resume as the persona of a candidate. So bring out the debonair presence of your resume and make it stand out from the horde that is as much deserving as you. Mohsin Qadir is a content developer by profession, but by passion he’s just a writer who simply loves writing and tackling topics that give meaningful insights into the job industry, resume writing, and such. When not writing, he loves to indulge in online gaming, movies, and TV shows.